Without question, President Donald J. Trump has been under siege — by the Deep State, by political opponents, and by the disgustingly dishonest “mainstream” media — since before the Nov. 8 election, in an unprecedented manner. In fact, as earlier reports have revealed, Trump and his campaign staff were targeted by an intelligence and ‘Justice’ Department that was weaponized by Barack Obama and unleashed by his staff in ways that are tantamount to political espionage. One of the few journalists who broke story after story on the Obama administration’s “unmasking” of Americans tied to Trump’s campaign is Sara Carter of Circa News. In an interview with The Daily Signal, Carter said the political abuse heaped on the Trump campaign by Obama and his operatives should be the focus of congressional investigations. Carter said the Obama regime pored over the private conversations of Americans “at an exponential rate,” adding that between 2011 and January 2017, unmasking of Americans — previously a rare occurrence — increased by more than 300 percent. Carter also reported that the Obama administration had been accessing the emails of one out of every 20 Americans, or five percent of the population. In the same interview, Carter said there is “no evidence” that she’s seen indicating “collusion” between the Trump campaign and Russia — a narrative that has died down dramatically in recent weeks as other narratives (Trump is a racist; his White House is in chaos, etc.) have taken hold. She said there was “some smoke” due to the fact that Donald Trump Jr. took a meeting with a Russian lawyer in June 2016 under the premise that he would be receiving Russian government-supplied dirt on his father’s Democratic opponent, Hillary Clinton, but that was it. She also said this: “We do see a lot of evidence money exchanging hands and meetings, as well, on Hillary Clinton’s side” — money paid to her husband, former President Bill Clinton, by Russian interests with ties to the Kremlin, as well as to the Clinton Foundation. 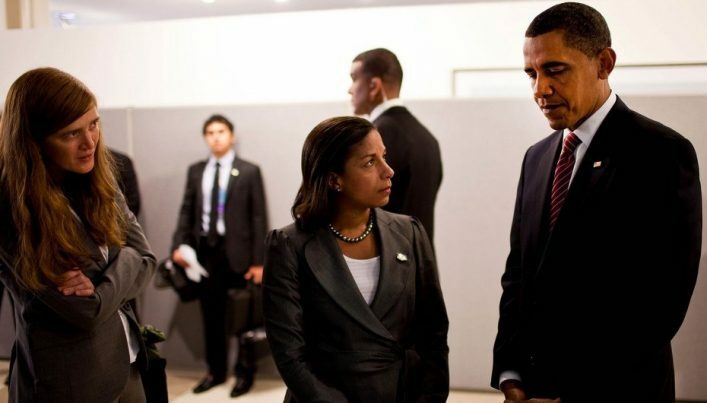 As for the unmasking, “what we are able to discover was actual documentation” from the NSA and via the Foreign Intelligence Surveillance Act (FISA) courts showing that “the Obama administration actually loosened up the rules in 2011 that amounted to a substantial invasion of privacy for all Americans, even putting information from priests, attorney/client relationships, and doctors at risk of being violated. “These are managerial positions. It’s very rare that anyone in these positions” would need to unmask individuals, she said. Carter noted that the House and Senate intelligence committees have launched investigations into the unmasking, but the House’s effort appears to be more comprehensive. It’s unclear where those investigations stand. What is known, however, is that there has been a special counsel appointed to look into Election 2016 collusion and corruption — involving Team Trump, not Obama, which is incredulous. That special counsel, former FBI Director Robert Mueller, has hired a slew of Democrat-supporting prosecutors and has widened the investigation from merely examining alleged Trump-Russia collusion to include financial dealings of Trump and his inner circle.